Offered in various configurations, materials, and wire ranges,Â ILSCONÂ® terminals feature UL-Certified design. Wire markers, also available, come in several types: slide/snap-on, adhesive pre-printed white vinyl labels, as well as cassettes and kits. Cable ties and mounts have industry-standard design and come in different lengths, tensile strengths, and colors. Without requiring heat source, Cool SealÂ® containsÂ anaerobic sealing gel that works via oxygen deprivation. 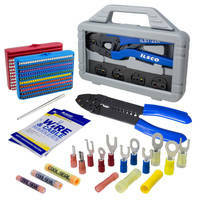 Cincinnati, OH – ILSCO’s extensive offering of wire management solutions includes ILSCON® terminals, Cool Seal® splices, crimp tools, wire markers, cable ties and mounts. Our ILSCON terminals are UL Certified and feature an extensive array of configurations, materials, and wire ranges. ILSCO delves into a new realm with the addition of wire markers that include the following types: slide/snap-on, adhesive pre-printed white vinyl labels, as well as cassettes and kits which can be ordered complete. Cable ties and mounts are industry standard and available in a number of different lengths, tensile strengths, and colors. An ILSCO exclusive is Cool Seal which contains a patented anaerobic sealing gel that works on the premise of oxygen deprivation. As the wires penetrate the gel and enter the splice, air is forced out of the cavity initiating a chemical reaction. By crimping each end, additional oxygen is removed from the area which allows the gel to seal around the splice creating a solid and airtight connection. No heat source is required, and creates a UL Listed connection with a wire range from 10 – 22. Like all of the products in ILSCO’s family of wire management solutions, Cool Seal will save you time, money, and provide a safer work environment.